Crafting Adventures: Anyone for Anya? - Lucky Numbers! Anyway, enough moaning. On to my card for this weeks Anyone for Anya challenge! This week we are sponsored by Jacobi and the theme is Lucky Numbers. Yep, all you have to do is make sure you include a number somewhere on your creation. I thought outside of the box a little and used a sentiment stamp from Whimsy with numbers in it. I adore this new TGF image, just don't look too closely as it is bleed central in certain areas. Naughty cardstock wanted to eat up my Copics! Stamps: 'Buddies' by The Greeting Farm, available here at Dies to Die For. Sentiment: Whimsy Circle Postmarks from Whimsy Stamps. Copic Markers: E00, E11, E50, E51, E53, R32, R35, R37, R59, B60, B63, W1, W3, W5, W7. 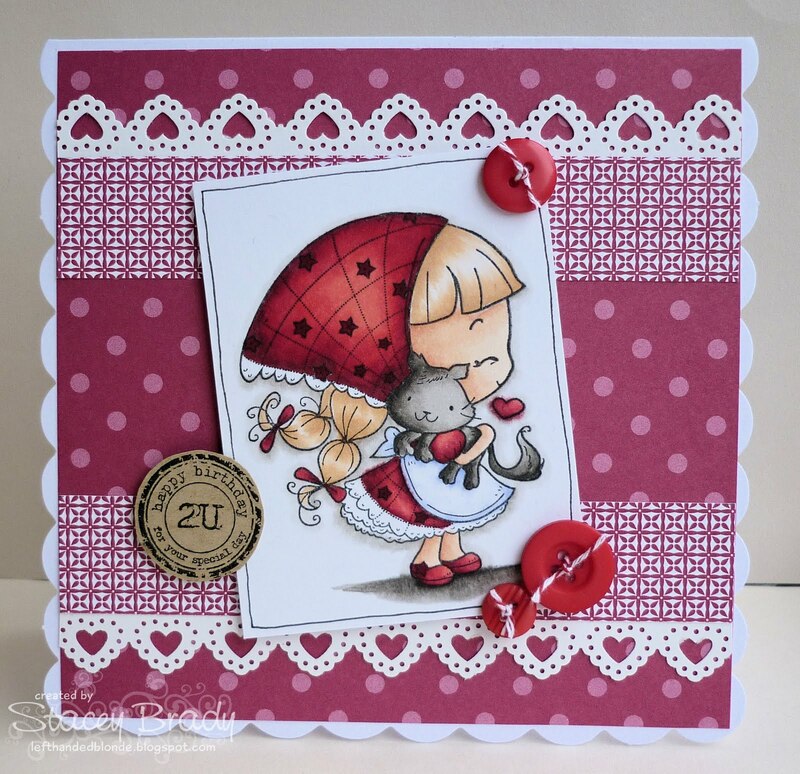 Tools & Embellishments: Buttons from stash, MS Valentine Lace Border Punch, Craftwork Cards Scalloped Edge Cards, MS Bakers Twine - all available from Dies to Die For. Right, thats is all from me, gotta go and tend to the roast chicken! Well, I need the energy as I've just signed up to the gym to try and get fit for the summer. Think of me at 6am tomorrow morning when you are lounging in bed and I'm killing myself on the treadmill.....! Stacey this is SWEEET! What a darling image, great colors, and wonderful layout! OMG! What an amazing story. So sorry about your door, but thankful that your house was not burglarized. And that all is safe!!! Love your card...she is so sweet!!! Oh no! That's awful! I'm glad you're ok! Gorgeous card by the way! Oh my goodness what a scare, hope all it sorted now.